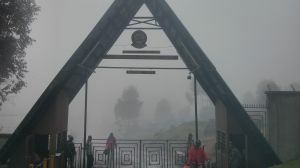 Mweka gate is an exit point from the Kilimanjaro national park for hikers using the Mweka route. Exit point because the Mweka route is used by descending hikers only, thus hikers can only exit and not enter through Mweka gate. There are few park authorities offices onsite and the gate lies on the edge (but inside) of the park's rain forest region. 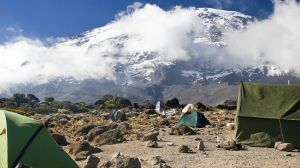 Most hikers exiting at Mweka gate would be those that are coming from Millenium campsite or Mweka hut. Mweka gate is used as an exiting point by more than half of the seven hiking routes, namely the Northern circuit, Lemosho, Shira, Machame and Umbwe routes. Mweka gate is located on the southern border of mount Kilimanjaro near Uru west ward, of Moshi rural district. Its surroundings are mostly rural residential houses with a lot of greenery but fewer trees than those available inside the park's rain forest. Things such as large shops may be hard to find nearby, however most of these as well as hotels, offices and restaurants can be found in the urban part of Moshi nearby. Are you associated with Mweka gate? Contact us to improve this page or create another page for your business.